This week, I'm working on two different projects, but the progress is so minimal on my second, I'm only showing one here. 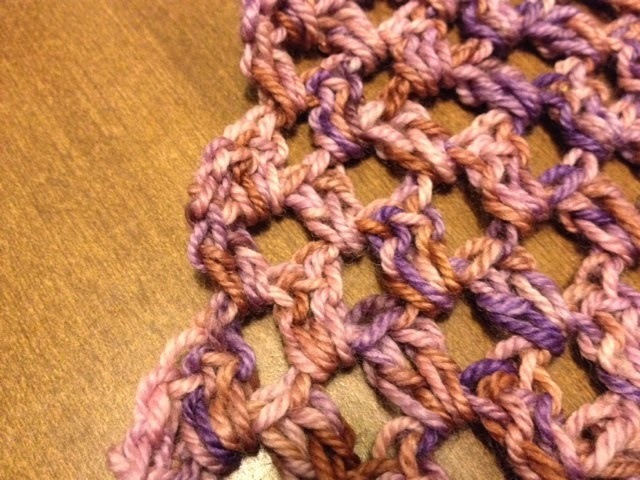 I'm working out a more substantial diagonal scarf pattern. 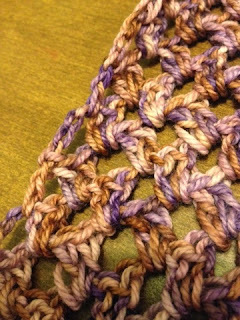 This is my sample, crocheted with a G hook in Three Irish Girls Glenhaven Cashmerino. 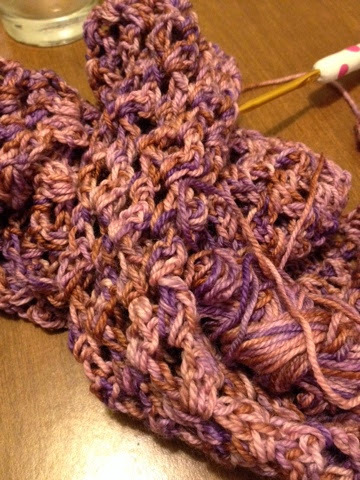 The yarn is something I would've never purchased for myself, but I received in a swap and I LOVE it! I've been looking through stashes, trying to find another colorway that I might be able to purchase from someone. No luck yet, but I will keep at it. I had leftover from a previous project, and thought a sample is a good thing to use leftovers for. This will definitely be something I share with my sister, as the current scarf I have in this color really gets worn- I'm not a brown girl. It's also definitely a sample scarf. As you can see pictured above, I was having trouble coming up with a way to make the decreasing edge even. Two days ago, I tried another method, which cleaned up my edge immensely. 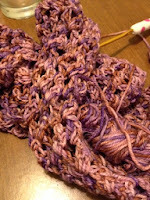 There are plans to try this again, narrower, with a more "me" yarn. My leftover ball has gotten me far, and I should be finished by Friday, if I work really hard. Such an interesting stitch pattern and lovely colours in that yarn. Very pretty. I'm looking forward to seeing it finished!